I've been keeping a Table of Contents of my lab notebooks since I was a grad student, initially on paper but for the past 20+ years as a Word file. As can be seen from the screenshot above, each experiment has a number, and I record the date and a few words about what I was trying to do and what I found. Before I kept this blog, searching it was the easy way to find experiments on a particular problem, and it's still a very valuable resource. One good thing about keeping a Table of Contents is that updating it forces me to go back over every experiment I've done lately. So I've just done that for everything since May 2012, and it was very informative. Here I'm going to write a summary of the experiments that I'd like to now follow up on, especially noting where RNAseq would be appropriate. Experiments with the HI0659/0660 antitoxin/toxin genes: We had found that a HI05659 knockout mutation completely prevents competence, that a HI0660 mutation doesn't affect competence, and that both genes were homologous to a known antitoxin/toxin pair. This suggested that HI0660 encodes a toxin that blocks competence and HI0659 encodes an antitoxin that blocks this. Now I've shown: Competence is not restored by the sxy1 or murE749 hypercompetence mutations, which act by increasing sxy expression. 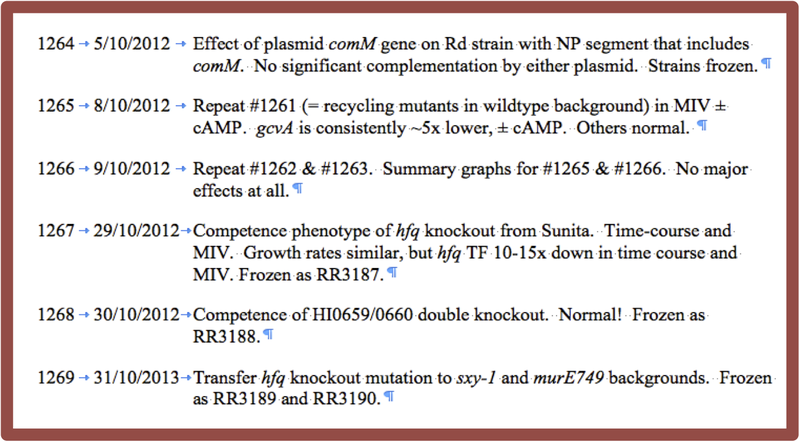 The HI0659 mutation does not cause a dramatic change in expression of lacZ fusions to the competence genes comA and rec2. A HI0659/0660 double mutant transforms normally, confirming the hypothesis that HI0659's job is to block the activity of HI0660. The HI0659 mutant grows just like wildtype in a BioScreen culture, suggesting that the toxin is either not expressed in noncompetent cells or has no activity that affects growth. Gene expression in these mutants has been examined by RNAseq. I'll describe these results in another post, but replication is needed. Experiments with the hypercompetence mutation murE749 and peptidoglygan recycling mutations: I first remade all the strains and rechecked the MIV-induced competence phenotypes of our set of four peptidoglygan recycling mutants, in a wildtype background with and without added cyclic AMP and in sxy1 and murE749 backgrounds. There was quite a bit of variation, but all were approximately normal on replication. The occasional dramatic differences may just be noise, or could result from some sensitivity to the details of the experiments. The only consistent difference is that the gcvA mutation (a putative regulator) was about 3-5-fold less competent than the others. We should definitely do RNAseq of the murE749 mutant, and maybe of the gcvA mutant too. Effect of hydroxyurea: The small molecule hydroxyurea (HU) specifically inhibits the enzyme ribonucleotide reductase, which converts NTPs (RNA precursors) to dNTPs (DNA precursors). Thus HU depletes dNTP pools and stalls replication forks (demonstrated in E. coli). If H. influenzae competence is a response to blockage of DNA replication fork progression, HU should induce competence. But it doesn't. If competence protects H. influenzae cells from the harmful effects of stalled replication forks, competent cells should be less sensitive to HU. But they aren't: cells that become transformed show the same sensitivity to HU as non-competent cells, and mutations that cause hypercompetence do not reduce sensitivity to growth arrest or killing by HU. BUT. these is a connection between competence and HU. One competence-induced gene turns out to provide substantial protection against the harmful effects of HU. dprA is in all characterized competence regulons, where it coats incoming DNA and promotes homologous recombination. it's also present in many more species not know to ever become competent, although no non-competence function is known. A dprA knockout has about the same effect on HU sensitivity as a mutation in recBC, which is well established as serving mainly to help DNA replication recover from stalling. But an E. coli dprA mutant isn't more sensitive to HU. Isolating more hypercompetent mutants: Highly desirable, but a badly executed series of experiments. It did produce lots of EMS-mutagenized cells stored at -80°C. I should first test these for induced novR mutations, and if seen then redo the selection for hypercompetent mutants. These mutants, if obtained, would be good candidates for RNAseq analysis.